WESTFIELD Helensvale is usually a place for new fashion – but today it’s all about the fads of yesteryear. 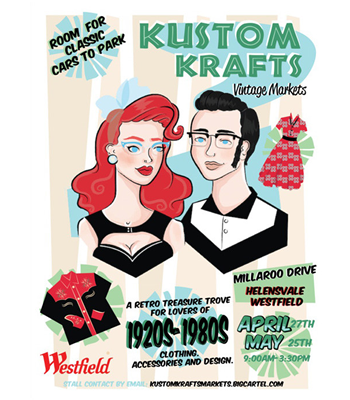 The Kustom Kraft Vintage Markets will be at the local shopping centre on Millaroo Drive selling retro-style clothes, accessories and design from 9am-3pm on Sunday. It includes stallholders from Brisbane, Toowoomba and Byron Bay. The markets have been introduced due to the recent surge in interest when it comes to retro culture, providing a little dose of old-fashioned style.